Loss of mobility is a well-known part of the aging process and can be a common issue amongst older Americans. For many, mobility limitations can be extremely frustrating and can result in loss of physical strength and reduction in social participation. That’s why it’s important for senior living interior design professionals to develop ways to encourage movement within the senior or assisted living communities. It can not only improve physical and mental health, but it can improve quality of life for residents as well. At Warner Design Associates, we try to focus on designing environments that strengthen the health, wellness, and safety of the community. Here are a just a few examples of ways to promote mobility in senior living interior design. Many individuals in assisted or senior living centers use assistive devices such as wheelchairs or walkers to help with daily movements. We suggest designing wide walkways in hallways, outside, or in community areas to comfortably accommodate these devices. This will help seniors feel more confident moving freely throughout the facility and can ease stressors commonly associated with obstacles or narrow paths. Did you know that about 1/4 of the elderly population over 65 will experience a fall each year? With this in mind, it’s important to emphasize safe movement throughout senior living communities to reduce the possibility of falling. We suggest having handrails placed along the hallways to support residents that need assistance walking between rooms or moving throughout the facility. 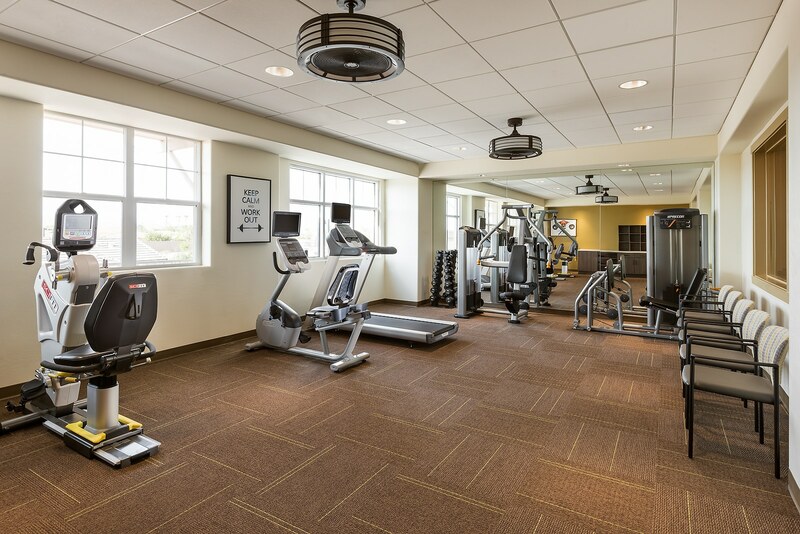 Fitness centers and wellness programs are a common trend in many senior living communities since regular exercise can lead to increased strength, balance and mobility. Yoga is just one example of a low impact workout that can help strengthen bones, muscles, and lungs. That’s why it’s commonly practiced in many communities. Yoga promotes gentle stretching, balance, coordination, and improved breathing techniques for seniors that can strengthen one’s ability to move freely. Dogs are known to be therapeutic companions who can often relieve feelings of stress or depression which is why they are commonly seen in my senior living communities. They can also be extremely motivating when it comes to fitness since they encourage owners to take daily walks and get outdoors. Walking can help improve muscle and bone strength as well as increase flexibility. We suggest designing pet-friendly environments, walking paths, and areas specifically designated for furry friends to encourage regular movements. It’s important to incorporate opportunities for residents to interact with one another into the design. Outdoor spaces, garden areas or community centers are great examples of social amenities that encourage communication and regular movement. Since mobility is important to the health and happiness of residents, it’s important to consider ways to promote movement in your senior living interior design. If you have any questions about safe mobility or ways to encourage movement, our team is happy to help. Feel free to contact us and check out our portfolio here.